This example shows how to generate CUDA® code for the Object Detection Using YOLO v2 Deep Learning (Computer Vision Toolbox) example from the Computer Vision Toolbox™. Environment variables for the compilers and libraries. For information on the supported versions of the compilers and libraries, see Third-party Products. For setting up the environment variables, see Setting Up the Prerequisite Products. The DAG network contains 150 layers including convolution, ReLU, and batch normalization layers along with the YOLO v2 transform and YOLO v2 output layers. Use the command net.Layers to see all the layers of the network. The yolov2_detect.m function takes an image input and run the detector on the image using the deep learning network saved in yolov2ResNet50VehicleExample.mat file. The function loads the network object from yolov2ResNet50VehicleExample.mat into a persistent variable mynet. On subsequent calls to the function, the persistent object is reused for detection. %   Copyright 2018-2019 The MathWorks, Inc.
% A persistent object yolov2Obj is used to load the YOLOv2ObjectDetector object. % Annotate detections in the image. To generate CUDA code from the design file yolov2_detect.m, create a GPU code configuration object for a MEX target and set the target language to C++. Use the coder.DeepLearningConfig function to create a CuDNN deep learning configuration object and assign it to the DeepLearningConfig property of the GPU code configuration object. Run the codegen command specifying an input of size [224,224,3]. This value corresponds to the input layer size of YOLOv2. Code generation successful: To view the report, open('codegen/mex/yolov2_detect/html/report.mldatx'). Set up the video file reader and read the input video. Create a video player to display the video and the output detections. 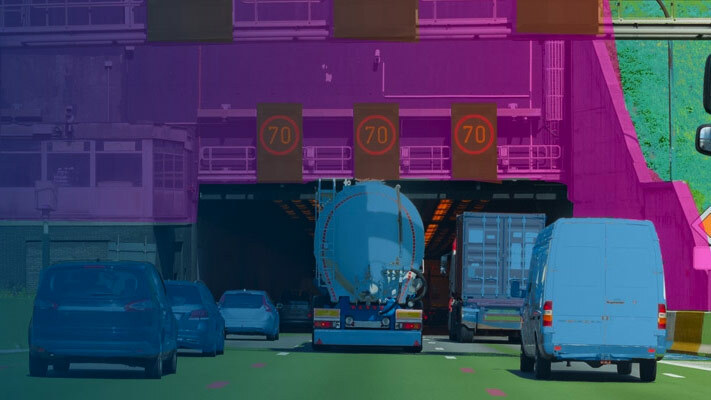 Read the video input frame-by-frame and detect the vehicles in the video using the detector. Redmon, Joseph, and Ali Farhadi. "YOLO9000: Better, Faster, Stronger." 2017 IEEE Conference on Computer Vision and Pattern Recognition (CVPR). IEEE, 2017.